Carpet protective film really sticks to the carpet. Very adhesive, sturdy, easy to install. With all traffic it didn’t come up or even tear. We appreciate your professionalism in your work and look forward to establishing long term business relationship with you in the future. Your film quality is good. I hope that we will be long and good partners. 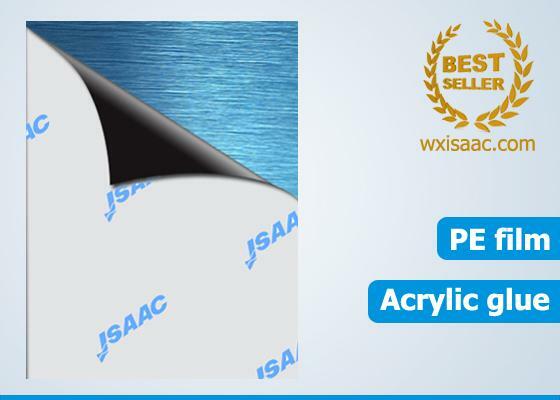 Hot sale protective film for brushed stainless steel No. 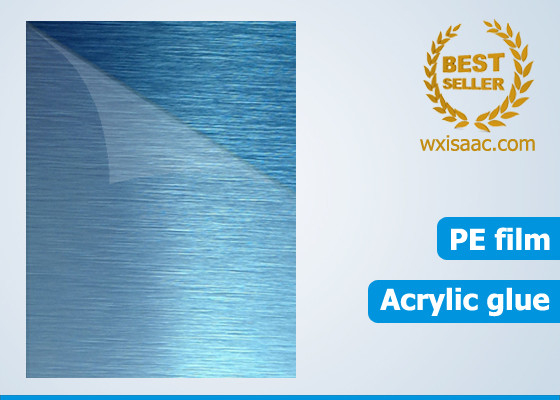 4 finish is used to protect stainless steel sheet with No. 4 finish, which is brushed finish commonly seen on kitchen appliances and backsplashes. Compare to mirror finish and BA finish, No. 4 finish is quite rough, so it requires higher adhesion strength. Even stainless steel No. 4 finish is rough because of its texture, but it texture is neat and orderly. So random scratches also damage its surface and destroy its nice appearance, thus devaluate stainless steel sheet or products. So stainless steel sheet No. 4 finish normally has a protective film on one side to help protect against scratching and dirt during fabrication and installation. No matter it is 304, 316L or 430, all brushed stainless steel No. 4 finish can be protected with this protective film during shearing, bending, punching, welding, storage, transportation and installation. Protective film for brushed stainless steel No. 4 finish can be applied conveniently by hand or machine. When fabrication and installation are finished, the protective film can be peeled off very quickly and no cleaning is required. However, some protective film is providing protection while the others are polluting the surfaces. Buying protective film on the market is easy, but please make sure that you have paid for the real protection. 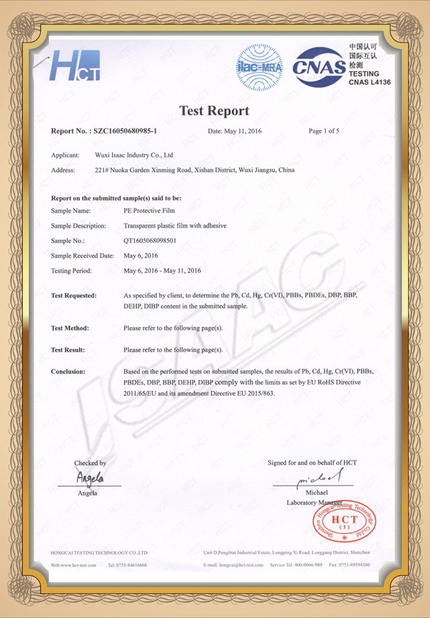 If Isaac has the honour to receive your trust and order, we must say that you don't only pay for the protective film. What you pay for is guarantee. Guarantee that our protective films perform well to prevent scratches and dirt when they are applied on the surfaces. Guarantee that our protective films can be easily peeled off in a whole piece without leaving any residue on your surfaces. Protective film for brushed stainless steel No. 4 finish is also fairly mature product which has been used by lots of customers for over 15 years. Some models are as follow. * Customized protective film is also available. 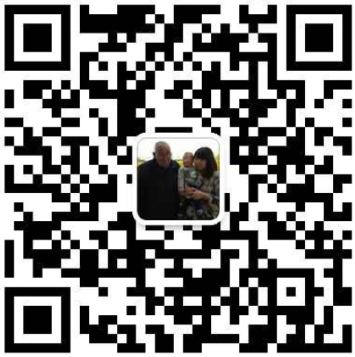 Thickness, width, length, color, adhesion all can be adjusted according to your product and requirement. Once order is placed, before protective film for brushed stainless steel No. 4 finish reaches you, it will go through all these below. Only after all these processes, we can trustingly deliver the goods to you. 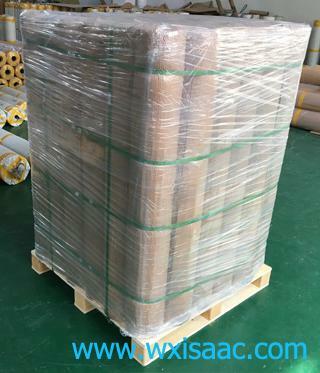 Protective film ready for shipping. 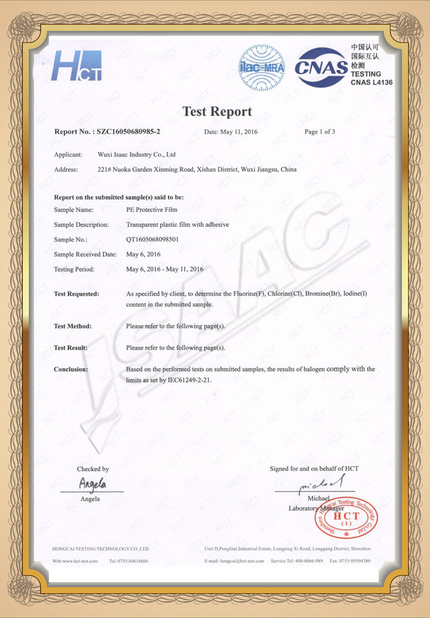 Wuxi Isaac Industry Co., Ltd.
China Good Quality Protective film Supplier. Copyright © 2016 - 2019 wxisaac.com. All Rights Reserved.